Does networking success for you equate to multiple contacts in a short time? Here’s your chance to make as many as 20 new contacts in under 30 minutes, in a controlled, facilitated environment. 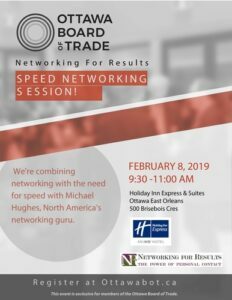 Join Michael Hughes, North America’s Networking Guru, and a select group of Ottawa Board of Trade members on Feb. 8th, between 9:30 and 11 am for networking with a twist. This event is a unique and exciting experience that will combine networking with the need for speed. Value-Added Program: includes a 30-minute post-event presentation to ensure you translate your SPEED-NETWORKING investment into real results.